The combination of the ink black, bright white, and almost rasberry red stain on the chest, make the male of this species visual poetry in my eyes. 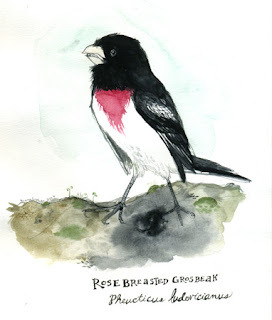 Grosbeaks are in the same family as cardinals and buntings (Cardinalidae). As you can see, grosbeaks and other members of this family have large, stout beaks perfectly adapted for crunching seeds. As with tanagers (see previous post) there is quite a bit of sexual dimorphism, in which the males are brightly colored and females are more inconspicuous. I had prepared a male that had knocked into McCormick place while migrating, no doubt.